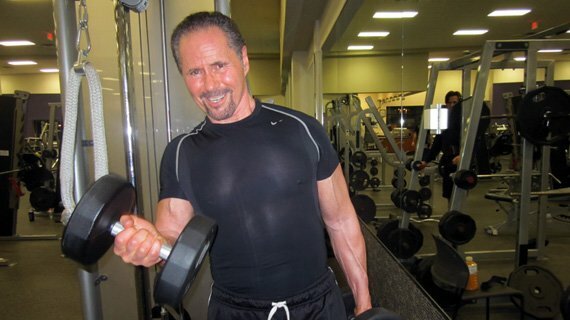 Joe's an old pro whose fire for fitness is still burning bright. 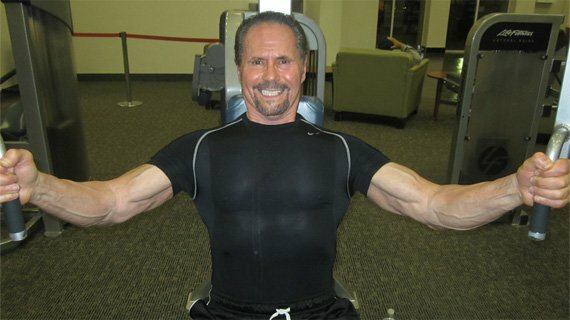 At 67, Joe is 200 pounds and lifting strong. Playing professional football in the late 1960s I had a re-occurring shoulder injury; I separated and dislocated it many times. I went to gym to do my own rehab as there were no rehab centers in those days. I saw bodybuilders who competed and wanted a challenge to compete again. I started to work out and entered my first contest after only 3 months, then went on to win Mr. New Jersey after 17 months (1969). I was ranked top ten in the country in 1971. 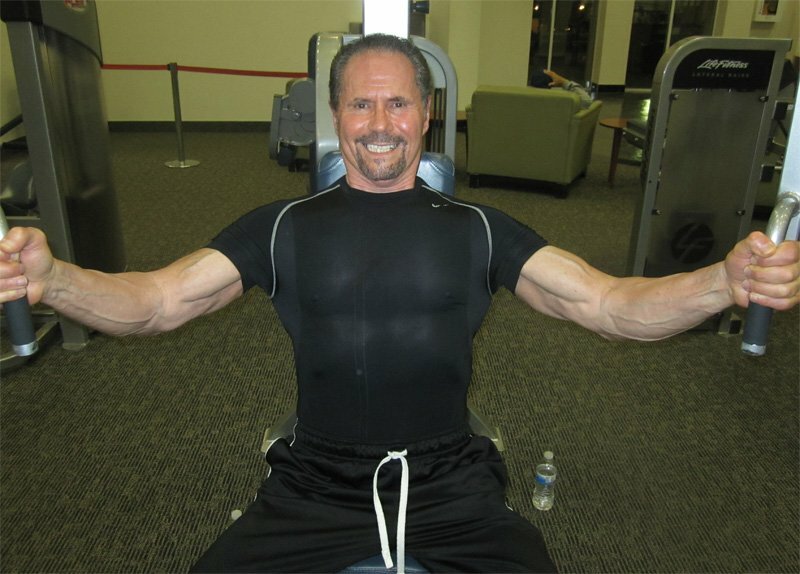 Old shoulder injuries haven't derailed Joe's training train! In those days we worked each body part twice per week about 2 1/2 hours per day 5-6 days per week. Note: Workouts and cardio will vary when preparing for master's contest. I had never before eaten 6 meals a day. Back when I started, breakfast was eggs and toast, lunch was tuna, raisins, and an apple, and dinner was steak and salad. During contest prep I only took in about 1700 cal/day (and no drugs). Nowadays I've made many improvements to my diet for better results. Low carb for 3-4 days only 50-75 grams/day. On occasion I would substitute 10 egg whites and one yoke for regular meat meal. 300, 400 or 500 grams each consecutive day for 3 days during contest season. I drink 12-16 glasses of water a day in between meals, all days. I take half of all supplements 1/2 hour pre workout and 1/2 hour post, these include arginine, omega 3's or flax seed oil, GLA caps, multivitamins, BCAA's and glutamine. I also try to get papaya enzyme tabs with each meal. Which you will find very unusual. Grin and bear it? More like grin and curl it! Powdered arginine, 5g 3 times per day has given me the best results of anything I take. Besides making a living from it, I love the challenge of competing and accomplishing my goals for health and sculpturing my body. Working out gives everyone a natural high that becomes addicting. Obviously, it improves confidence by making me look and feel at least 15 years younger and being so much stronger and healthier compared to the people who do not live the fitness/bodybuilding life style. 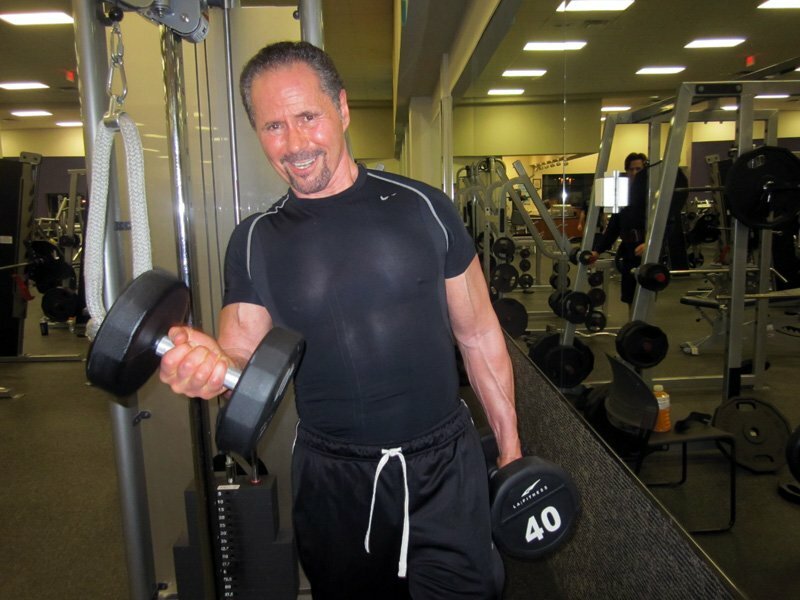 At my age, being 67, strength, well being and good health helps me enjoy a quality life. Without fitness and bodybuilding my energy and confidence would be much lower. I was a professional athlete who had a career-ending injury at the time. I needed some form of competition so I got into bodybuilding and wanted to be the best I could be at the time. I wanted to go against the best to see how I would fair against them. I had the desire, fortitude, discipline, and never-give-up attitude. Little All America football, Shippensburg Univ. To stay healthy, fit and live a quality life. Push thru hard workouts ... rest properly and never, never give up. 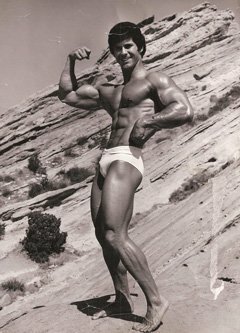 I always liked Steve Reeves, knew Arnold from Gold's in California back in the day, and went to college with Ken Waller. The Store and looking the up values of certain supplements.